With the sudden renewed focus on the Supreme Court this summer the theatrical premiere (July 13th at NYC’s IFC Center, July 27th at the Landmark Nuart in LA) of Kimberly Reed’s Dark Money couldn’t have come at a more apropos time. The momentous Citizens United decision of 2010 had a political game-changing impact across the U.S., nowhere more so than in Reed’s home state of Montana, a land with a long and sordid history of outside money influence — most notably from the copper barons, who once swept in to essentially buy the city of Butte. As a result, however, perhaps no state in the country is also better prepared to smell a corporate rat during election season — and to know how to fight back against an invisible billionaire invasion that affects us all. Filmmaker spoke with the deep-diving director — a “25 New Faces of Independent Film” alum — about her twisting, six-year trip following the Big Sky folks who follow the dark money. 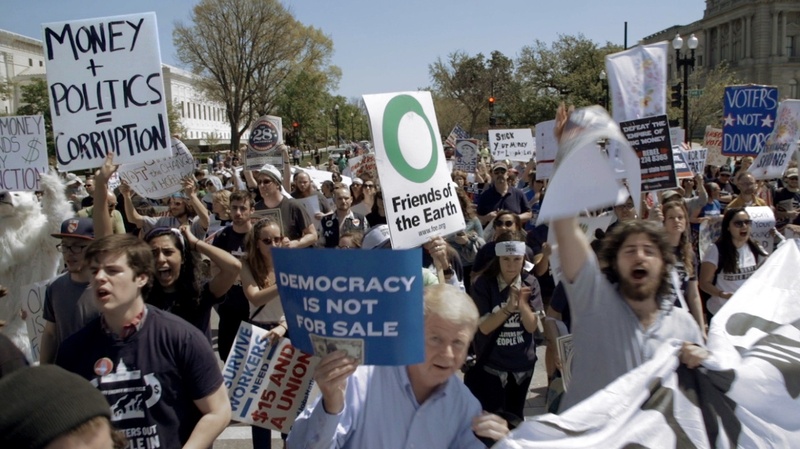 Dark Money opens today at the IFC Center, with Reed and journalist John S. Adams doing Q&As. Further screenings around the country in the coming weeks can be found on the film’s website. Filmmaker: So I’m curious to hear how being a Montana native affected production. Did being an “insider” from the state make it any easier to gain your subjects’ trust? Reed: Montana is a place where people often mention how long their family has lived in the state. It’s not uncommon to hear someone say, “I’m a third-generation Montanan.” Well, I’m a fourth-generation Montanan. Setting aside for now the important issue that many Native Americans in Montana have been there for 34 generations, I’m certain that it made it much easer to gain the trust of Montanans than if I’d been a filmmaker from New York parachuting in to tell the story. I also spent a lot of time there, returning many times to follow the developing story, so that made it clear that I was in it for the long haul. Most importantly, though, I think that being raised in Montana made me attuned to the nonpartisan populist skepticism of corporate money in politics. In grade school I learned the history of the copper kings, rich industrialists from the east coast who came to Montana to pull precious metals out of the “richest hill on earth” in Butte, Montana. I think this allowed me to see how a grassroots resistance to Citizens United would grow there, creating the landscape for a dramatic clash between citizens and the same group of lawyers who were responsible for Citizens United. That gut instinct that a story would develop was really essential to be able to stick with the film for the six years it took to complete. Filmmaker: You do speak with at least one individual representing a dark money entity, the attorney for American Tradition Partnership. Though aside from news footage, the politician recipients (most notably former Senate Majority Leader Art Wittich) of all this shadowy largesse are pretty much absent from the film. Were you just not able to get anyone to go on camera? Reed: Stories about money in politics get really complicated really quick. That usually makes for a complicated smokescreen for dark money groups to hide behind. I think one strength of our film is the tight focus of the story, which lets us connect the dots that hardly ever get connected. Following only the Wittich story allowed the film to focus as a microcosm rather than a broad overview, which would have sacrificed clarity. And the microcosm is constructed to cover all of the key issues one needs to know to understand campaign finance. We actually had interviews with other elected officials, but decided to concentrate on one main case, which ends up in a big courtroom trial. Filmmaker: (Minor spoiler alert.) One unexpected twist in the doc occurs when local gumshoe reporter John S. Adams, who’s been breaking the campaign finance stories, finds himself out of a job when his newspaper’s corporate parent massively downsizes. It’s a nice illustration of how the tentacles of corporations have a stranglehold on every aspect of American freedom, from elections to the press (often, ironically, under the guise of “free speech”). The corporate consolidation of news outlets, though, is also a whole other movie unto itself — which makes me wonder about the editing process. How did you decide which angles to include without getting sidetracked from your main outside-money-in-politics storyline? There are more twists to come in John’s story, but I’ll leave them for the film. Suffice to say that he endeavors in a way that inspires hope for the future of journalism, as the newspaper industry continues to restructure itself. We’ve already seen at festivals that our film inspires many journalists, including many affiliated with the Institute for Nonprofit News, a community of nonprofit media organizations. Like many journalists, I was inspired by watching All the President’s Men, and that film informed our editing process. I hope our film can inspire citizens to become journalists in the same way that great film did. Filmmaker: Speaking of corporations, I noticed that eBay founder Pierre Omidyar’s left-leaning, activist company First Look Media is involved in the film. How did they come onboard? Is First Look helping out with any sort of impact campaign? Reed: First Look Media is not supporting our impact campaign (though we have a robust one in the works), but we share their commitment to a free press and are proud to be in their roster of films about journalism, such as the Academy Award-winning Spotlight and Nobody Speak: Trials of the Free Press. Seemed like a good fit with our story about dark money, seen through the eyes of a reporter who doggedly pursues the facts. For an issue that is about obscuring the truth, we need to know we have a free and independent press who can do that work on behalf of all of us. We were also impressed by their support of The Press Freedom Defense Fund, which fights hard for the rights of independent journalists, including documentary filmmakers. First Look supported our film after editing had been completed, just before our debut at Sundance 2018. Filmmaker: As a filmmaker who followed Montana’s grassroots activists through three election cycles, which tactics did you see as being most effective, and were there any big strategic failures? Any tips for the midterms coming up? Reed: One of the most effective weapons dark money groups have is timing — they wait until the last minute to dump a torrent of advertising on an opponent, who doesn’t have the time or money to respond. Montana, like many states, has now regulated that activity, but dark money groups continue to exploit vague language and loopholes. Another sneaky tactic is to operate during primary elections, and in safe districts. What we saw in Montana was Republicans attacking fellow — yes, it was all men — Republicans in places where a Republican was sure to win. So the aim of the election influence wasn’t to elect a Republican over a Democrat, it was to elect a Republican pre-vetted to vote a certain way. It wasn’t a matter of electing a Republican, it was a matter of what type of Republican, in an effort to “purify” the party. As you can imagine, this common tactic really polarizes legislatures by eliminating moderates. And it’s just one aspect of how dark money destroys democracy. The good news is that these dark money tactics take advantage of low voter engagement. An engaged citizenry like we saw in Montana, that holds elected officials accountable and makes campaign finance a priority, can change the political culture and clean up elections. The main way to force strategic failures and fix broken elections is to pay attention. Voters can take back the reins! There are other solutions too. Most find a way to incentivize candidates to spend time campaigning with everyday citizens instead of just attending cocktail parties with millionaires and billionaires. Small donor public financing — especially with matching funds like in Maine and New York City — give everyday citizens a voice in their democracy, and open up elections to women and minorities in the process.